When you are first learning how to Mig weld aluminum one of the first things you should do is to get plenty of contact tips...like get at least a whole pack of them. This is more important than you might think because tips that suffer from a burn back where aluminum melts to the tip are tempting to reuse. But can cause you more trouble if you do. Aluminum is different than steel in this area. We all re use mig tips for steel routinely and its not a big deal. But aluminum mig wire is much softer and more susceptible to wire feeding problems. I am not saying you cant reuse them at all...but it takes a bit of work to remove the aluminum, drill out the tip and make sure the hole is smooth enough not to inhibit wire feeding. ...and any burr on the tip can cause an erratic arc or another burn back and that just makes the whole affair frustrating. Learning how to mig weld aluminum can be frustrating enough without added problems. Contact tips are roughly one dollar each. not expensive enough to require a loan…but also not worth the hassle they can cause from trying to reuse them once you have a burn back. So I suggest saving your burnback tips for when you just plain have no other choice or when you have time to re dress them with a sander and drill or oxyfuel torch tip cleaner. what causes black soot when you mig weld aluminum? Black soot is aluminum oxide. …which is weird because aluminum oxide is thought to be white in color but something about the small particles of soot makes it refract light in such a way that it looks black. A carburetor that is set too rich also produces soot. and its because of an inefficient burn. That inefficient burn can be caused by improper settings like excess wire speed…but it can also be caused by lack of argon shielding from bad torch angle, a leak, or insufficient flow at the flowmeter. 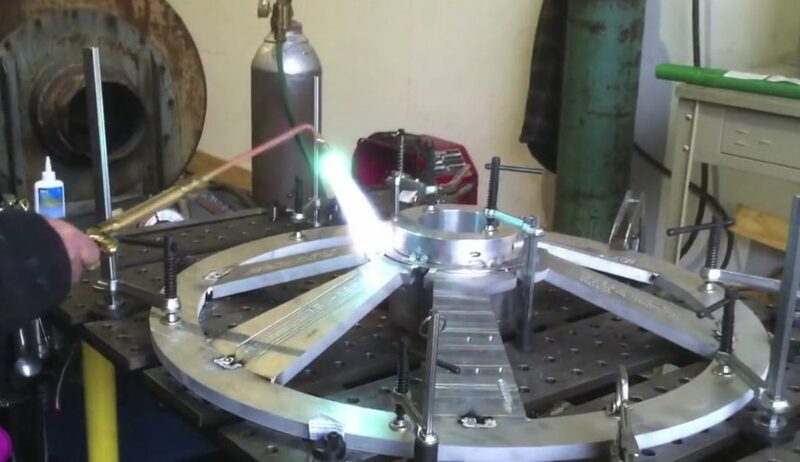 finding those settings that yield a soot free weld sometimes requires some trial and error. As you see in the video, I had some problems with a Hobart spool gun . By doing some trouble shooting, I learned that the gas shielding pattern was poor and that was the source of the black soot. It all made sense after learning that and I added a piece of scotch brite for a diffuser and man did things go better after that. For mig welding aluminum a push angle works best. And that is mostly because a push angle puts the argon shielding over the arc and other hot areas of the puddle that will oxidize if not properly shielded from the atmosphere. But what if the position of the weld or other objects in the way prohibit using a push angle? well, then you have to pull. But increasing gas flow rate a bit sometimes helps…. and soot is not always a big deal. 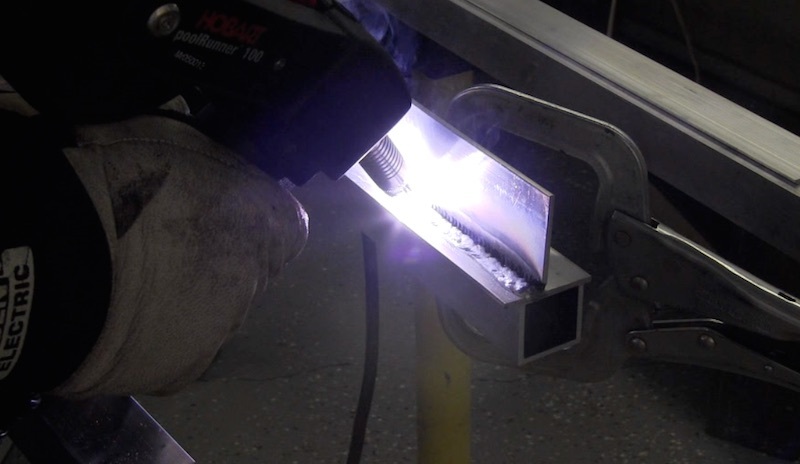 On multipass welds, you will want to wire brush all the soot with a stainless wire brush. Aluminum is conductive. Not only is it electrically conductive but very thermally conductive. that means it dissipates heat quickly . not a problem when mig welding aluminum from 1/8" (3.2mm) to about 1/2" ( 25mm) thick. But really thick aluminum welds a lot better with a preheat. A 200-250f preheat helps a lot on thick aluminum...whether you are tig or mig welding aluminum. what is the best stickout for mig welding aluminum? If you have been following me for anytime, you have probably heard me harp on using a short stickout for short circuit mig. But for mig welding aluminum, spray transfer is used. And a longer stickout works better for spray transfer….usually around 3/4” works . A short stickout on aluminum can burn up tips. what is the best wire type and size to use? I prefer 4043 over 5356 for general work. 4043 flows better and soots less in most cases. But sometimes the job calls for 5356 due to post weld anodizing. or maybe 5356 wire is specified on a drawing. Then you dont have the option of choosing what type wire to use. All these tips apply even more when using 5356 wire since it contains magnesium and soots more. What about diameter of wire? rule of thumb is to use the largest wire diameter that works good. For this video, I was using .035" ( .9mm) wire because that was the largest tip size I had. But For 1/8" (3.2mm) and above, I normally like to use 3/64" . 3/64" (1.2mm) diameter wire just seems more robust and more consistent for general spool gun work.